Even back then – when Dafydd ap Llywelyn was rising up against the English in Wales, Roger Bacon was compiling his scientific masterpiece Opus Majus in Oxford and Paris, construction was beginning on the ‘new’ abbey at Westminster – the English were writing songs about the birds singing. But it wasn’t just us. At around the same time, for instance, the Persian-language poet Jalāl al-Dīn Rūmī was also celebrating birdsong: ‘Birdsong brings relief / to my longing / I’m just as ecstatic as they are, / but with nothing to say!’ And it all goes back a lot further than the 1200s: we find birdsong in the Bible – ‘flowers appear on the earth; the time of the singing of birds is come, and the voice of the turtle** is heard in our land’, says the Song of Solomon – and in the millennia-old poetry of the ancient world. This thing has deep roots. Why? Why is poetry so noisy with birdsong? Birdsong is a wonderfully malleable material. We can make of it what we like; it’s putty for the poet. And like putty or paint or music or ink, it can be put to work as an artist’s medium, as a means of expressing ourselves. What we hear in birdsong, in other words, is more often than not the resonant echo of our own feelings. The end of the poem isn’t the end of this process. 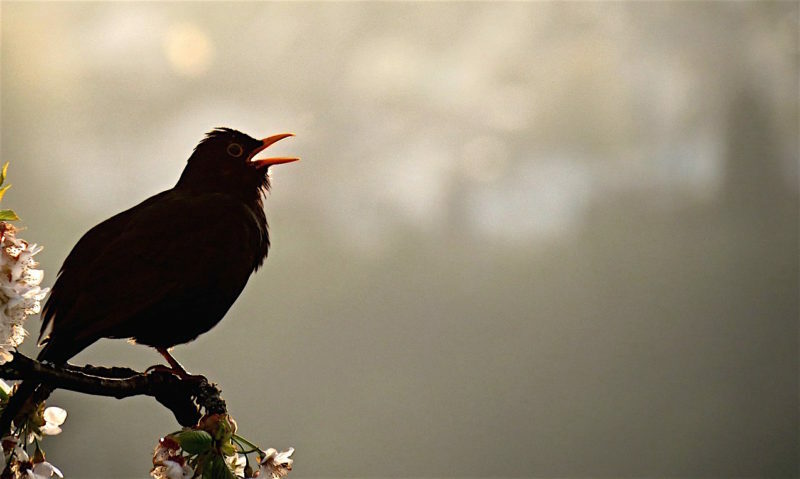 Birdsong has shaped our poetry, yes – but poetry, in its turn, has shaped the way we listen to birdsong, and what we think it’s saying to us. I heard my first cuckoo in the early summer of 2016, at the RSPB Otmoor reserve, a little way north of Oxford (I heard my first turtle dove – like a sort of soft, woolly power-drill – there too, that same sunny day, almost as soon as I’d climbed out of the car; it was my first time birding south of the Peaks, and it felt as though Otmoor had parcelled up the lowland English pastoral tradition, just for me). On hearing the cuckoo’s call, I didn’t exactly back my head and cry Lhude sing cuccu!, but I’m sure I cracked a smile. It was a bright, warm day; I had a summer’s morning to myself, and I’d just heard my first cuckoo; what was more, I would be attending the wedding of our dear friends Sam and Jeremy later on (that was why I found myself at such a dangerously southern latitude). I was, in short, happy – as was that thirteenth-century songwriter, as he anticipated the shortening of the shadows, the warming of the days, the greening of the land and the flatulence of the male deer. But these things are subjective; how I felt on hearing that June cuckoo depended on me being me. Someone else might have felt something different. And had I been a dunnock – or a reed warbler, or a pied wagtail, or a meadow pipit – I wouldn’t have heard anything in that lowing cu-coo but threat and menace. Cuckoos are, of course, brood parasites. Cuckoo nestlings, born in the nests of other birds, destroy the eggs and young of those birds, and grow fat – we’ve all seen the picture, at once ludicrous and heartbreaking, of a tiny parent bird perched on the shoulder of a fledgling cuckoo five times its size, feeding it caterpillars – on their scarce and hard-won resources. Cuckoos visit horror on their hosts. That’s what a dunnock or a warbler hears in the cuckoo’s call. It’s a curious noise, the call of the cuckoo. It has a slightly hollow, woodwindish quality, suggestive of someone blowing across the top of a bottle; it’s unhurried, almost complacent – pretty rare in birdsong – and low in pitch. I can, without too much effort, detect a note of languorous menace in it; if I were a breeding dunnock, I’m sure I would hear it loud and clear. And yet at the same time it does, as in the Reading Rota, have a meadowy, sun-steeped joyousness about it, too – it is the sound of sumer icumen in. The fact is, it’s a cipher. What we find in it depends on us: on who we are, where we are, what day it is, perhaps even the books we read or the music we enjoy. It’s as variable as the weather; it can shift with the orbit of the earth, and the changing of the seasons. * ‘Reading’ because the oldest manuscript copy was found at Reading Abbey in Wiltshire; ‘Rota’ because the song is a kind of part-song known as a rota or round (like ‘London Bridge is Falling Down’ or ‘It’s a Long Way to Tipperary’). ** That’s the turtle dove, by the way – not an unexpectedly musical terrapin. I believe this is your first published book of nature writing. You have an eclectic publishing history – novels of the jazz age and the history of toilet paper spring to mind – what made you want to write this book? I’ve always been a bit of a jack-of-all-trades in terms of what I like to read and learn about (I tend to be whatever the opposite of an obsessive is). Being a freelance writer, being always on the lookout for a new opportunity, a new niche to work in, entrenches that – so yeah, I’ve written on a pretty diverse range of subjects (you could also throw in hockey goalkeeping, car insurance and illustrating Rabelais). But two things have always gripped me: fiction writing, and natural history. It’s only in the last few years that I’ve felt able to focus more particularly on these areas. Writing about nature for BBC Wildlife, The Guardian and the TLS put me in a position to finally think about writing a nature book – and birdsong, something I’ve always had a bit of a conflicted relationship with, seemed like a good fit for me. What did you learn in the process of writing and researching the book? Oh, god, loads. In practical, in-the-field terms, the process coincided with me getting more acquainted than I had been with a local patch of woodland, so as well as the hours spent thumbing through musty bird books (don’t get me wrong: musty bird books are among my favourite things to thumb through) I was passing the early hours in the company of singing wrens and thrushes and blackcaps and all the rest. So that was one kind of learning curve. Another was the sheer amount of material I had to get to grips with. Some people have asked me how on earth I managed to write a whole book on the cultural history of birdsong. Well, I could have written ten books and had material left over. Wrangling centuries’ worth of information – from science, from literature, from music, from social history – into a neat package of thirty-odd thousand words was a challenge (it’s not a problem you have when you’re writing a history of toilet paper, believe me). But I enjoyed every minute of it. One of the things I really noticed about your book was your openness about things you don’t know. And the realisation that not knowing doesn’t mean you don’t care, just that you hadn’t noticed. You’re known for having some pretty trenchant opinions on popular nature writing – is this related? Yes! I have, it’s true, written some intemperate things about certain styles of nature writing. I may be more fixated on prose style and tone than many other critics of non-fiction – I think it’s so important. Obviously, I’ve set myself up for a righteous beating if I don’t practise what I’ve been so noisily preaching, so it was on my mind while I was writing the book. These were my rules: be honest; be yourself; don’t pose, don’t pretend. That was about it. So when I didn’t know something – which was quite a lot of the time – I felt it was important to say so. It’s just not a big deal. Your tone is irreverent but never over-bearing or facetious, which is unusual. Was it a conscious decision to write like this? If so, why? That’s good to hear (though I think it’s a bit facetious at times, isn’t it?). The style came very naturally – as I said, I was dead-set on not writing in character, on being myself. It’s not as though I frown on fancy language – quite the opposite, really. I love swanky and ambitious prose. The thing is, I think you can write that sort of stuff without striking a pose, without hamming it up. Your writing can be fantastically elaborate and still feel natural. Human is a word I overuse in my criticism; I mean it as a real compliment, and it’s what I was aiming for in this book. You also talk about the habit people have of assuming every bird singing at night is a nightingale — even in the middle of the London winter. Do you think the misidentification matters or is the magic of the moment more important? That’s a really good and complicated question. Of course, it’s normal, natural, to not know things. I’d never have a problem with someone saying I don’t know much about nature, but I know what I like. No-one can know everything, in any case, and besides there are a lot of different ways of looking at the world. But I do think that’s it’s good to know things; I’d be happier if more people knew more things. Emotional responses are fine, great, and I’m all for them (I’ve even been known to have them myself from time to time) – but it seems to me that knowledge, information, is needed to give structure and texture to them and to everything else. It’s the motes of dust and grit a raincloud needs in order to make rain. Otherwise all you’ve got is a lot of damp, drifting air doing nothing in particular. Do you think birdsong has a role in connecting people to nature? Or is it, like in the novels you analyse, likely to always be just background noise? I think it has an immersive effect. Once you start noticing it you realise just how often you’re in amongst it. It’s everywhere. Perhaps that can make us more conscious of how embedded we all are in the natural world (despite our best efforts). And it can help us develop something like a personal relationship with birds, too. That sounds a bit daft – but I think that learning a bit of birdsong, or just making a point of listening to birdsong, is a step towards getting to know the birds better, to seeing them properly, in three dimensions. If not quite as individuals, then as more than set dressing. It’s an easy(ish) way in to everyday ecology. Richard Smyth writes about wildlife for The Guardian and BBC Wildlife and about nature, books and culture for the Times Literary Supplement, New Statesman, New Humanist and others. He’s the author of five non-fiction books and a novel, Wild Ink (2014). His prize-winning short fiction has been widely published and his crosswords appear in journals including New Scientist, History Today and History Revealed.